Summer 2012. "A young Tunisian died of wounds during the protest pitting Salafis against police in the eastern city of Sousse, a hospital official said." On 9 August 2012, protests hit the Tunisian city of Sidi Bouzid, "amid growing discontent with the state of the country" a year and a half after the CIA revolution that ousted Ben Ali. Tunisian police fired teargas and rubber bullets to disperse protesters demanding jobs in Sidi Bouzid, the site of the of the CIA false flag operation that triggered the CIA's Arab Spring uprisings. Doctors at Sidi Bouzid’s hospital said six people were injured. Under the new government, there has been an increase in food prices, poverty, unemployment, rioting and crime. Interruptions of water supplies in several provinces have added to the tension. Street anger has been on the rise in several parts of the country. The CIA's "al Qaeda in Tunisia". Al Qaida promises to kill all tourists who come to Tunisia. Ennahda's leader Rached Ghannouchi has denounced the growing number of "calls for regional and sectoral strikes." The General Workers' Union has criticised the detention of four trade unionists. Ennahda has been criticised for seeking to curtail freedom of expression, most recently with a draft law to criminalise offences against "sacred values" that could carry a jail term of up to four years. JUNE 2012. "The Tunisian government imposed a dusk-to-dawn curfew in eight areas of the country, including the capital, after rioting blamed on ultra-conservative Salafi Muslims left dozens of police officers injured. The wave of violence ... mostly targeted courts and other state buildings. "Police in the capital Tunis fired tear gas to disperse protesters who torched a local courthouse and attacked several police stations. "Protesters blocked streets and set tyres alight in the working class Ettadamen and Sidi Hussein districts, hurling petrol bombs at police in some of the worst confrontations the city has seen since last year's revolution. "By morning, protests had spread to a number of residential districts, with young men preventing trams from passing through the Intilaqa district of the capital, where shops remained closed. There was evidence of looting in some areas, where shop windows were smashed. Summer 2012 riots in Tunisia. Tunisia's New Government Confronts Rising Discontent. The government "is grappling with a poor record". The new leadership is still grappling with an economic in crisis, a worsening security situation, "the proliferation of corruption and the growth of smuggling." "Roughly 15 daily sit-ins, 10 general strikes and eight blocked roads were reported by the Ministry of Defense during the month of May alone." The credit rating agency, S and P, has downgraded Tunisia’s long-term credit rating to a speculative BB/B. There has been a "resurgence of violence and vandalism and social crimes". In the first quarter of 2012, Tunisia's tourism revenues are down, as violence escalates. "A report compiled by the Egyptian Yafa Research Center found that the Mossad's intelligence net is spread across several Tunisian metropolises - each branch with its own speciality. "The branch stationed in Tunis, for example, tracks targets in Alegria. "The one placed in Djerba, an island located 500 kilometers southeast of the capital, traces Libyan targets. 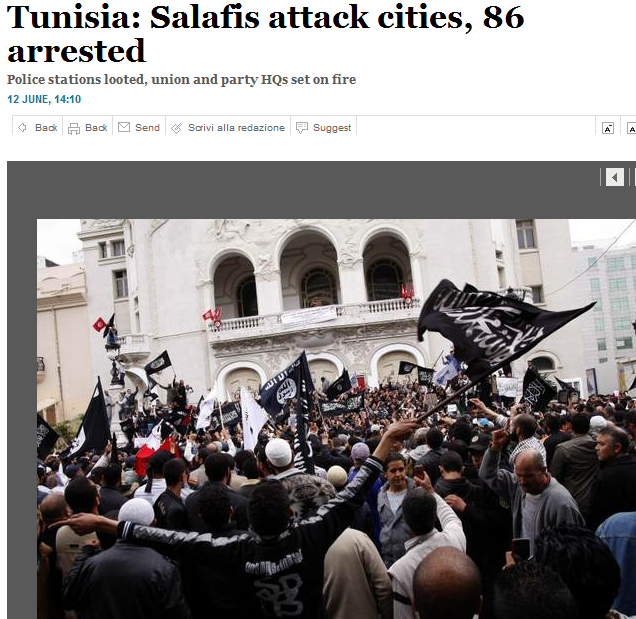 "The Sousse office deals with Tunisian internal affairs, the report claimed." In May 2012, in Tunisia, a tourist convoy was approached by two trucks transporting around thirty men. The suspected Salafists were armed with rocks and batons. One of the tourists’ vehicles managed to escape the mob and made it to the police station. The tourists were accused of drinking alcohol and publicly fraternizing with women by the attackers, who insisted that they were the ones who enforced the laws. One of the cars was broken into, and several of the passengers were pulled out of the car. Israel has issued repeated warnings of an insurgency attack on Tunisia. Travel Advice for Tunisia - Australian Department of Foreign Affairs. We advise you to exercise a high degree of caution while travelling in Tunisia because of the unsettled security situation, the risk of further civil unrest and the threat of kidnapping and terrorist attack. Al-Qa'ida in the Lands of the Islamic Maghreb (AQIM) has made threats against a range of targets in Tunisia, including government, industrial and commercial buildings and tourist sites. In planning your activities, consider the places known to be terrorist targets. These include government facilities and commercial areas known to be frequented by foreigners such as, but not limited to, Western diplomatic missions, oil facilities, residential areas, hotels, clubs, restaurants, bars, schools, market places, places of worship, outdoor recreation events and tourist areas. A number of tourists and foreigners have been killed in past attacks. A State of Emergency remains in place across the country. You should be aware that authorities may restrict travel or enforce local curfews with little or no notice. Since 18 December 2010, protests and political unrest have occurred in locations across Tunisia. These have involved violent clashes with police and the use of live bullets and tear gas, and have resulted in deaths, injuries and extensive damage to property. The Iranian strategic expert "Muhammad Sadek Al Hussaini", revealed that the information, documents and papers accumulated by the Iranians,conveyed and discussed by the first man in the Iranian National Security in Tehran "Saeed Jalili" with the Syrians in details, stating that there is a US-NATO decision to turn Northern Syria into an "Al Qaeda" block in the face of the Russian and Chinese influence, similar to the days of fight against the Soviet influence in Afghanistan.. Along with the attempt to open another front against the growing Iranian influence on the base of what Iran calls "the Islamic awakening", and the West call "The Arab Spring" after the failure of all the attempts of a foreign intervention against Syria. Al Husseini confirmed that Jalili discussed with the Syrian command, the prospects of a Western dash toward igniting an open regional war prepared by the West and committed by Turkey to be as a"Trap" to Erdogan's government. The strategic expert revealed that Jalili confirmed to president Assad Iran's willingness to stand firmly and without any hesitation toward any plot to manipulate the Syrian national security, and the plan to overthrow Syria is considered by Iran as a direct threat to her national security, not just losing a resistant strategic ally..
Al hussaini stressed that Jalili confirmed to the Syrian command that the aggression will return to the enemy in the same level. The Iranian expert quoted president Assad notifying the Iranian command that the potentials of the Syrian Arab army capable of defending Syria with the possibility of changing the rules of engagements in any moments basis the alliance coordination. Al Husseini said: "In case of any danger against the regional national security of the resistance, we will come to the enemy by Land, Sea and Air, and will fight an open battle so that not one soldier of the enemy will live to tell the world the results of this battle... "
IS ERDOGAN A CORRUPT BILLIONAIRE? ARE YOU PART OF THE 1% ? THE 'CIA'S IRISH TERRORISTS' IN LIBYA? 'CIA-LINKED' MAN KILLED IN SYRIA; LINK TO 9 11. CIA FORCES KILL 19 IN CHURCH? SUPPLIER OF KIDS TO TOP PEOPLE? MACAULAY CULKIN - CIA BRAINWASHING VICTIM?